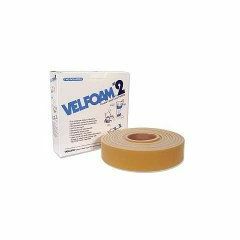 Velfoam Padding For moderate closure applications. Foam covered with hook-sensitive material on one side, nylon on the reverse. Soft and comfortable against skin. Stretchable to prevent constriction. Hypoallergenic. Reusable and washable. 15'L. Velfoam #2 is double faced. Choose from 2" or 6" Beige.